The Model 907 has been strategically designed to generate & evenly distribute tremendous pressure throughout the entire platen. And, its cast-in tubular heating element heats the metal from within, to produce consistent and long lasting heat. A successful heat transfer application requires 3 key elements to work in tandem– time, temperature & pressure. The Model 907 has mastered those elements and gets the job done every time. 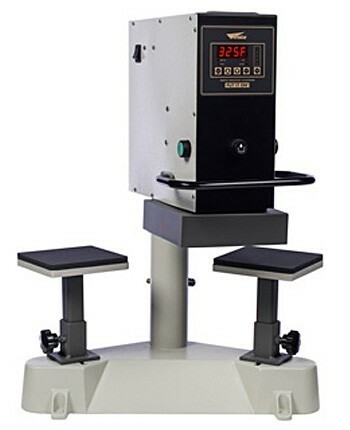 The Model 907 features 2 independent 6”x6” lower platens and a 6”x6” upper heated platen that swings between the two for optimal efficiency. While one side is engaged, the other side can be loaded – there is no down time. The result is increased production, which adds to your bottom line. Its lower platens can be easily lifted out and replaced with smaller 2.5”x2.5” lower accessory platens for the application of small tagless labels. Its pressure source is strategically placed over the center of the upper platen and uses struts to drive that pressure out to all corners. 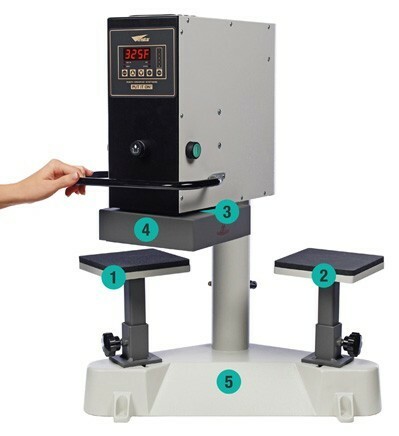 The result is an even and heavy duty distribution of pressure that is unparalleled by other heat presses in the market today. Machines made from cast metal are considered to be the highest quality and are strong enough to withstand heavy use without warping or bending. The 907 is extremely durable and, if cared for properly, can last up to 25 years.